Almost everything was sold before he even arrived at Art Fair Tokyo, but that didn’t stop gallerist Peter Nagy from coming to Japan anyway. The impulse to dip his toes into what could become contemporary art’s next deep pool was just too strong to resist, so three large canvases by artists Thukral & Tagra from his hot Indian gallery, Nature Morte, made the journey with him. By all reports, for those galleries that did make the trip with art to sell, it was well worth their time. The majority of overseas exhibitors at the new international 101TOKYO Contemporary Art Fair — from places such as Hong Kong, New York and South Africa — joined many Japanese counterparts in selling out their artists’ works. With two major fairs, two major auctions and ample additional events such as the Shin Marunouchi Building’s New Tokyo Contemporaries exhibit and Art Award Tokyo, the metropolis was teeming with artists, gallerists and collectors from all over the globe. 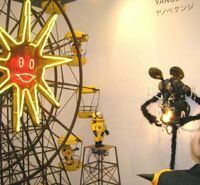 The buzz was palpable at the busy start of Art Fair Tokyo and the theatrical opening of 101TOKYO, with the smell of money, perfume and fresh paint mingling in the air. For many overseas gallerists such as Vergon, the goal is simple: To get their foot in the door of what may well become a significant market. Vergon, like some others at 101TOKYO, was considering the possibility of setting up shop here. 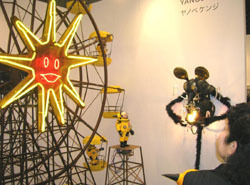 Dominique Perregaux of Hong Kong’s Art Statements Gallery was pondering the same decision after he sold out of the glossy paintings of characters from the 1980’s anime series “G-Force” by the original illustrator, Amano Yoshitaka. Perregaux originally opened his Hong Kong gallery to gain access to China and its collectors. But he’s found that the market there is so speculative that the art takes a back seat to the deals. “The sophistication of Japanese, Korean and Taiwanese collectors — supporting their own artists and buying art that they really do like from all regions of the world — makes them and their own art market less vulnerable to a global economic downturn,” says the former businessman. Miles Thurlow’s first week in Japan didn’t start well: The new Heathrow terminal lost his luggage, forcing him to make time to buy a suit when he could have been sightseeing, meeting other gallerists or preparing for his gallery’s Japan debut at the new 101TOKYO Contemporary Art fair. By the end of the week, however, his fortunes had changed. 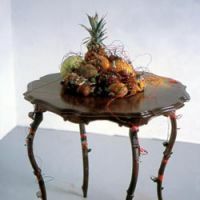 Newcastle, England’s Workplace Gallery, which he and partner Paul Moss founded in 2002, picked up 101TOKYO’s first-ever Bacon Prize for “Enough Rope,” an installation by Jo Coupe. 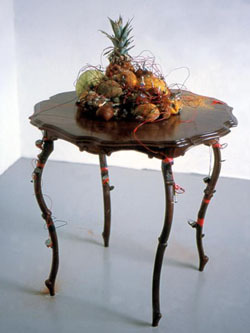 “Enough Rope” has rotting fruit lying on a wooden table, their skins pierced by wires leading to small engines powering cutting tools that are slowly carving away at the table legs that hold it all together. Coupe’s work toys with destruction, as well as preconceptions of science: Does the citric acid in fruit have enough power to saw through table legs? I found myself returning periodically to check on their progress. Coupe’s works often use scientific elements to make a point. In “Give and Take,” roses hang in a copper-sulfate solution that seals the flowers’ beauty in copper sediment while gradually tearing them apart under the additional weight of the metal.